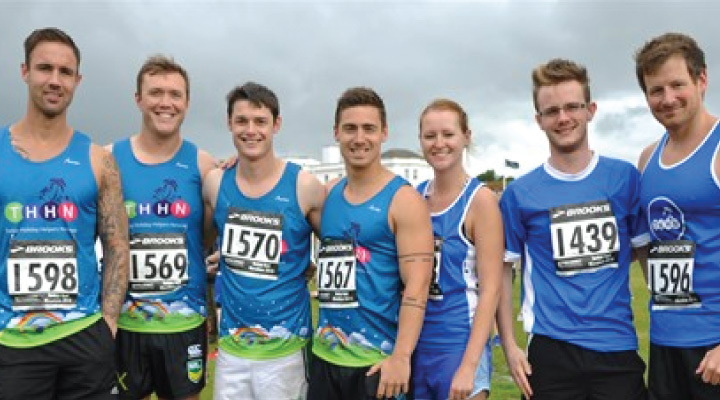 Come and join the south wests premier charity running team and let us look after you! We are proud to be an affiliate charity for the 2013 Great West Run and we are looking for runners to join our rapid growing team of “memory Makers”! Is that you? All of our runners get a free top quality dri-fit running vest or t-shirt, we can provide you with a training plan if needed and a wealth of knowledge is at hand from our founder Luke Tillen who is an accomplished ultra runner. We can even give you guidance on your nutrition! We even have our very own “THHN Runners Forum” on Facebook, where you can communicate with other THHN runners, exchange tips, share experiences and keep up with each others training progress. You can also use this as a place to post any questions you may have about training, diet or running events. On race day we will try very hard to provide all finishing THHN runners with a free sports massage and our own post race goody bag as a way of us saying thank you! At THHN we fully realise what a big commitment it is to undertake the challenge of running a half marathon and we want to look after you every step of the way! Want to join us on the big day and raise funds? Unfortunately ALL free places have now been filled within the first 48 hours of being released! If you miss out on our free places you can still run for us by entering yourself into the race. We can provide you with a training plan, sponsor forms and links to set up your own JustGiving page so you can raise funds online. You will still receive your running top, massage and goody bag! WE LOOK AFTER OUR RUNNERS – THE CHARITY RUN BY A RUNNER!